VBE and ICBO Variations – Many transistor circuits are required to operate over a wide temperature range. So, another aspect of bias circuit stability is Bias Circuit Thermal Stability, or how stable IC and VCE remain when the circuit temperature changes. Measures to deal with the effects of hFE variations have already been discussed. These apply whether the different hFE values are due to temperature changes or to hFE differences from one transistor to another. 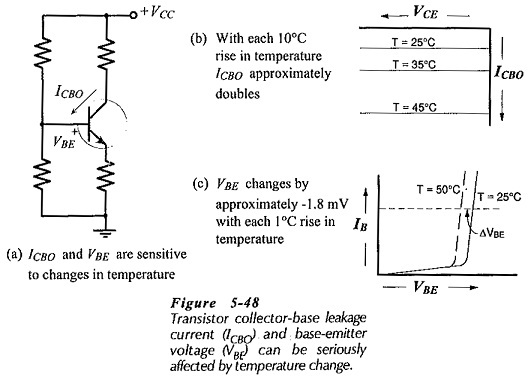 The base-emitter voltage (VBE) and the collector-base reverse, saturation current (ICBO) are the two temperature-sensitive quantities that largely determine the Bias Circuit Thermal Stability of a transistor circuit, [see Fig. 5-48(a)]. The base-emitter and collector-base pn-junctions have the temperature characteristics. For a silicon transistor, VBE changes by approximately -1.8 mV/°C, and ICBO approximately doubles for every 10°C rise in temperature. These effects are illustrated by the characteristics in Fig. 5-48(b) and (c). An increase in ICBO causes IC to be larger, and the IC increase raises the collector-base junction temperature. This, in turn, results in a further increase in ICBO. The effect is cumulative, so that the end result might be a substantial collector current increase. This could produce a significant shift in the circuit Q-point, or in the worst case, IC might keep on increasing until the transistor collector-base junction overheats and burns out. This effect is known as thermal runaway. Measures taken to avoid thermal runaway are similar to those required for good bias stability against hFE spread. Changes in VBE may also produce significant changes in IC and consequently in the circuit Q-point. However, because of the possibility of thermal runaway, ICBO changes are the most important. The Bias Circuit Thermal Stability is assessed by calculating a stability factor. The stability factor (S) of a circuit is the ratio of the change in collector current to the change in collector-base leakage current. The value of S depends on the circuit configuration and on the resistor values. The minimum values of S is 1. This means that if ICBO increases by 1 μA IC will increase by 1 μA. If a circuit has an S of 50, then ΔIC = 50 x ΔICBO. A stability factor of 50 (or larger) is considered poor, while a factor of 10 or less is considered good. The ICBO change and the circuit stability factor can be used to determine the change in IC, (Eq. 5-18). Then the resulting VCE change can be investigated. 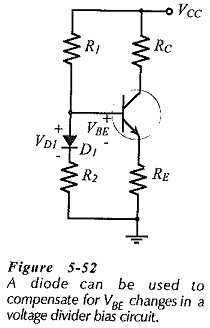 As discussed already, the emitter resistor voltage should typically be selected as 5 V, (VE >> VBE). This is to ensure that IC is not significantly affected by changes in VBE. Thus, the circuit in Fig. 5-51(a) (with VE ≈ 5 V) has greater stability against VBE changes than the one in Fig. 5-51(b) which was designed for VE = VCC/10,(VE = 1.2V). Base bias and collector-to-base bias are less affected by VBE changes than voltage divider bias. This can easily be demonstrated by considering the equations for the base current in each case.